Everyone loves a rescue story with a happy ending, especially when it features pure and innocent creatures like dogs and cats. When we hear tales of animals overcoming tragedy, it’s hopeful and reaffirming that the earth we live on is a good one. While there are many rescue stories that may go untold, here are some which feature the less than expected to receive a helping hand. For all of these rescues, click on the picture to learn the whole story. Camels are known to be resilient to the elements, as they can survive days in a desert without sustenance. They eat and drink in excessive amounts to store it as fat in their hump, and even have the ability to regulate their body temperature according to environmental conditions. This is why Sydney’s story is unusual, but also a common result of bad care takers. Sydney was born in a Petting Zoo and not given the proper care needed as a baby camel. The above picture is Sydney at his new home with new care takers that have helped him go from 118 lbs to 1400 lbs in 3 years. You may have seen the video above, what with 3 million views and all. This video of a man helping remove a can from a skunk’s head went viral last month, but is still worth noting as an unlikely rescue. I don’t know how many people would try to do the same as this guy, especially with the risk of being sprayed. 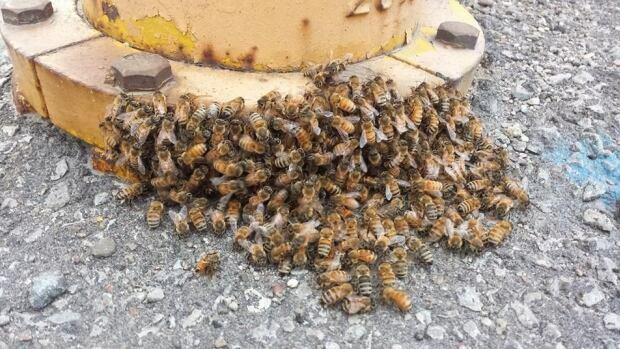 These bees were found huddled to a fire hydrant without a queen in Toronto, Canada. Thanks to the efforts of Facebook, the man who found these bees was able to successfully gather them into a cardboard box and transport them to a Beekeeper. The keeper has since reported that they are happy and doing well in their new home! This isn’t the story of just one opossum, but a shelter that saves an average of 100-200 of them a year. The website, WildCare, features a video of releasing a family of rescued opossums back into the wild. For the most part we think of these guys as regular home intruders or vermin, but opossums are a natural predator to several unwanted pests, such as cockroaches, beetles, even rats or deceased animals. Perhaps the most unexpected rescue of them all is Charlotte, a gigantic huntsman spider found where you’d expect to find giant spiders: Australia. While spiders don’t both me in particular, there’s no way I’d have the ability to do what this woman from Barnyard Betty’s Rescue did. She rescued Charlotte from another person which revealed intent to kill the spider outright, but Betty wasn’t about to have any of it. Charlotte was released on the rescue grounds, and even as wonderful as this story is, I’m still glad to know Charlotte is over in Australia and not in my backyard. Previous PostPrevious Reddit Pets ready for Halloween!